Anne says: You, too, can be a superhero like Paul Kriegshauser! 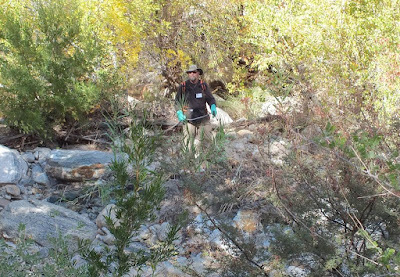 If you walked the canyon in August you may have seen Sabino Stewards busily trying to control the spread of invasive plants. The invasive problem is complex and long-standing, but I like to describe it simply: wherever these invasive plants take over, wildlife habitat is destroyed or significantly degraded. Many of you remember how the Sabino Giant Reed (Arundo donax) thickets surrounded and killed native plants and trees. We all love Sabino for its butterflies, lizards, bobcats and birds so we need to protect the native plants that provide them food, shelter and nesting areas. But enough preaching to the Sabino choir. When you see us volunteers in the canyon with backpack sprayers, we are spot-treating five perennial invasive grasses that are impossible to dig out effectively. They are buffelgrass, fountain grass, natal grass, Johnson grass and Giant Reed. Spot-treating means we go into every nook and cranny along the creek and roadside and when we find a target invasive, we direct a light spray of herbicide, marked with blue dye, on it. We use a 5 percent solution of the lowest-risk category herbicide. It is not toxic to humans or wildlife and is fully absorbed into the plant within 20 minutes. After all the spraying is completed, the total amount of active ingredient used is only ounces per acre. Because the herbicide is not persistent on dormant invasive plants, we have only brief windows of time—like monsoon green-up—during which we can treat the plants. So far in August, our team—Janis Findlay, Wayne Klement, Jim Klinger, Phil Bentley, Steven Boley and myself—in four sessions totaling 74.5 hours, have treated these invasives from Tram Stop 9 downstream to Bear Bridge, both on the creekside and on the roadside. If you would like to help, either with manual removal such as our upcoming Public Lands Day Event Sept. 24, or with the herbicide application, email me at sabinostewards (at) gmail (dot) com. 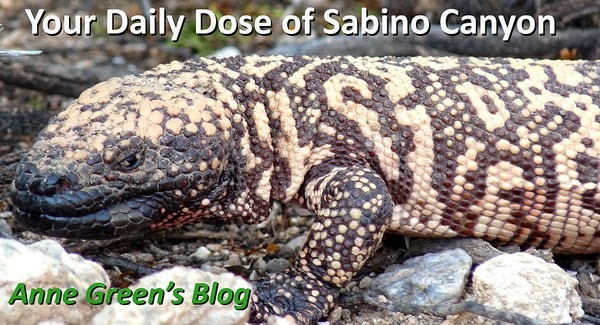 Read more about Sabino Canyon conservation efforts at http://www.sabinonaturalists.org/conservation/. A related note, there will also be USFS contractors in the canyon in the near future treating the higher, steeper canyon walls for buffelgrass.